Knit A Tiny Hat for Charity | Knit Like You Mean It. Hats from The Big Knit 2010: So Tiny! So Cute! Photo courtesy Innocent Drinks. I know, people. I’m always asking you to do weird knitting things for charity. But then you probably do weird knitting things anyway, so why not do some for charity? Here’s the latest: knit a tiny hat for Innocent Drinks’ The Big Knit. Started in 2003, The Big Knit raises money for Age UK, an organization that cares for the elderly in the United Kingdom. The fun thing about The Big Knit is that you’re knitting a tiny hat for a bottle of Innocent Drinks juice. Innocent is kind of like the UK version of Naked, except that their bottles are smaller. 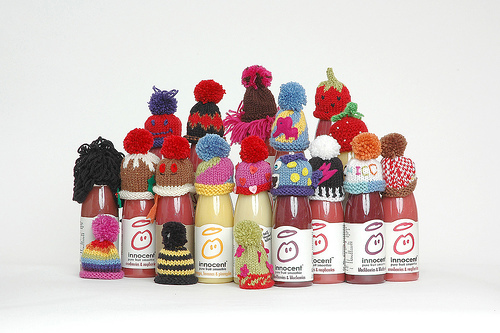 So what you do is, you knit a little hat that will fit on the top of a juice bottle, and then Innocent sells the bottles with the hats on to raise money (they donate 25p to Age UK’s Spread the Warmth for each hat that’s knit), and then people vote on which hats are the cutest. Last year, knitters around the world made 625,000 hats, raising £177,000 for the charity. You can see a gallery of past hats on the Age UK website. So, why do this? Here’s what I’m thinking. If you watched the Royal Wedding; if you made fun of the Royal Wedding; if you congratulated yourself on studiously ignoring the Royal Wedding, you’ve already gotten some entertainment from the UK this year. If you saw The Young Victoria in 2009 or Sherlock or Downton Abbey or The King’s Speech in 2010, or if you read books by Ian Fleming, Terry Pratchett, P.G. Wodehouse, or Martin Amis, you got something from the UK. [I’m going to put in a special plug to John le Carré fans here, because he’s an Oxford grad, and I stayed in the John le Carré room at Lincoln College the past two summers]. We’re inextricably linked to the British, and we might as well show them how classy we are by knitting them some tiny little hats. Plus, if you knit a tiny hat, and send me a photo of it, I’ll give you a sneak preview of the stash giveaways for the entire summer, and let you choose whatever you want from the pile. Who’s with me? 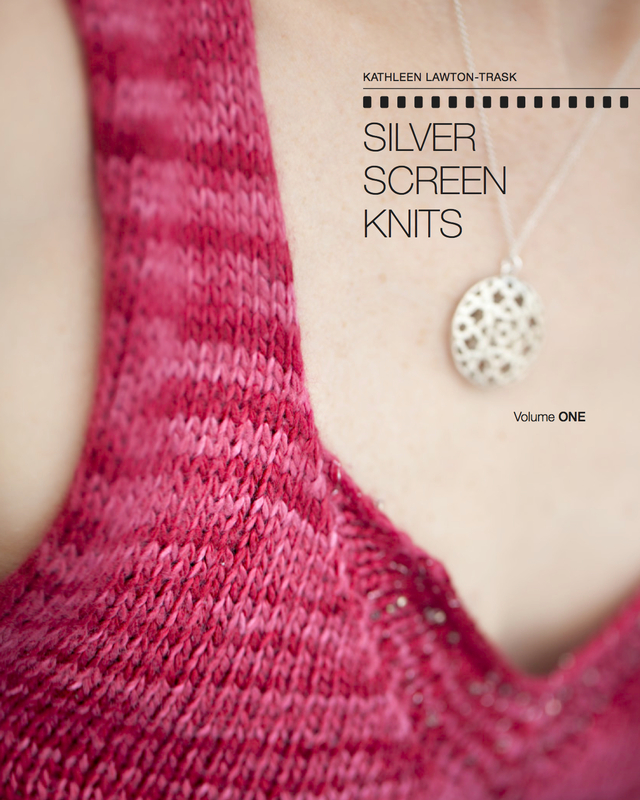 Patterns and other encouragement available on the Innocent Drinks website as well as the Age UK page for the 2010 Big Knit (including, hey, a pineapple pattern!). Let’s get cracking, people; Britain Needs More and Better Hats. Can you knit Royal Wedding hats???? I mean, I can’t, but I bet someone can.